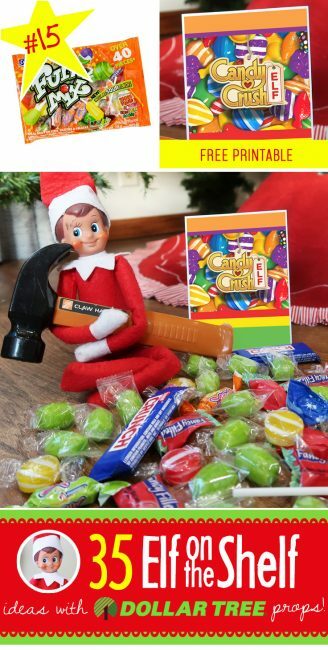 New Elf on the Shelf idea: Ummm…Elf…I don’t think that is how you actually play Candy Crush silly! Although, I guess this way kind of looks like fun, too. If nothing else, it could be a fun way to take out any built up Christmas stress!! This is another SUPER easy Elf on the Shelf idea that only takes a minute to set up. I think the most work is getting Elf to stay sitting upright! Luckily, the hammer helps to balance him for this one. And if you don’t have a hammer handy, they have some cute little ones at the Dollar Tree, too. You can grab it when you’re getting your other props! Please don’t hesitate to let me know if these links stop working at any point– that is the worst!! I will answer comments right away, no one has time for dead links this time of year ;) And THANK YOU for visiting our Elf on the Shelf ideas, we hope you find them easy and helpful. We hope your kids love this new Elf on the Shelf idea as much as ours did!! (And they will probably like eating the candy afterward, too, Elf was nice enough to share! !